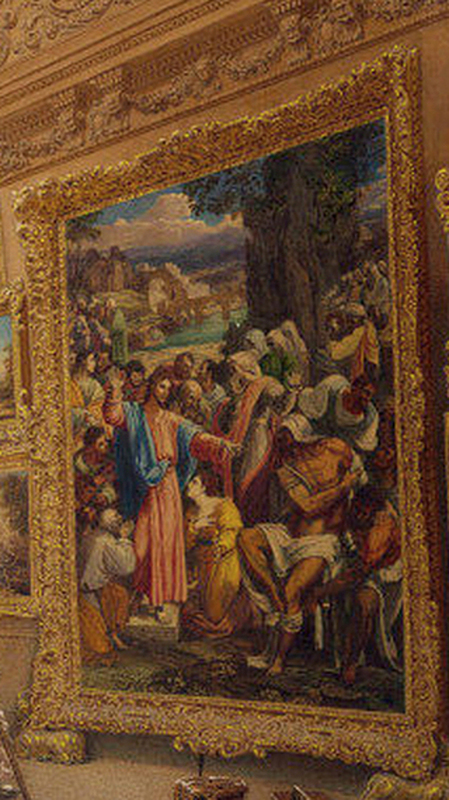 The raising of Lazarus by Sebastiano del Piombo has a symbolic place in the history of the National Gallery: its accession number is NG1, and it was amongst the most important of the thirty-eight paintings which formed the original core of the National Gallery collection when they were acquired by the government from John Julius Angerstein in 1824. But for more than three centuries it has suffered from a range of inappropriate frames; it has only now been resurrected as the truly resplendent Renaissance altarpiece it was designed to be, for the exhibition at the National Gallery: Michelangelo & Sebastiano, 15 March – 25 June 2017. The raising of Lazarus was commissioned by Cardinal Giulio de’ Medici in December 1516 for one of his sees, the cathedral of St Just & St Pasteur in the city of Narbonne in the Languedoc. Giulio (1478-1534) was the partly-legitimated son of Giuliano de’ Medici , brother of Lorenzo the Magnificent, who had been assassinated by the Pazzi conspiritors in 1478 at the age of 25. Giulio was born posthumously, and was educated by his uncle Lorenzo; by 1515 he held the archbishoprics of Florence and Narbonne, and had been made a Cardinal; he was elected Pope Clement VII in 1523. 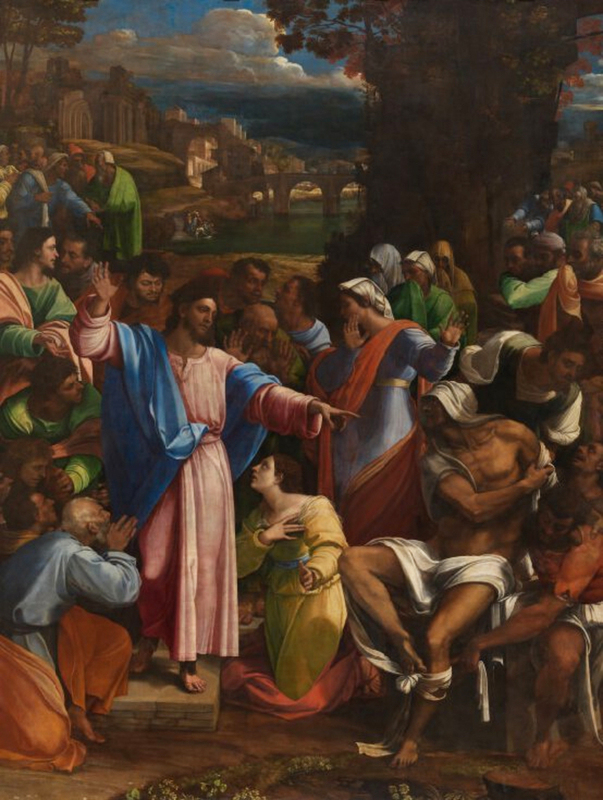 He had commissioned Raphael, also in 1516, to produce a painting of The Transfiguration of Christ, to which Lazarus was to be the companion , and Raphael continued to work on this until he died, in 1520. In 1523 The Transfiguration was installed in San Pietro in Montorio in Rome, rather than being sent to Narbonne – presumably because the Cardinal became Pope in that year. 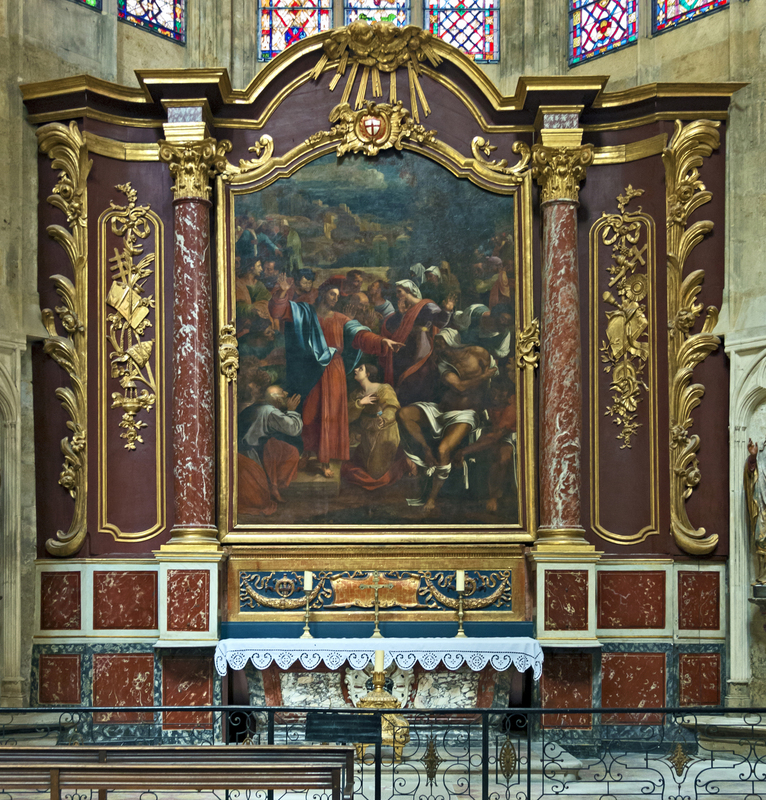 It is understood, although no explicit written statement of this has as yet been discovered, that the two paintings were to hang together in Narbonne; probably in opposing positions in the cluster of five oratories built out behind the high altar at the east end of the cathedral, since, as Rona Goffen points out, ‘the Transfiguration is lit from the left, the Lazarus from the right’ . They had also, possibly deliberately, been commissioned from artists who were competitive, to stimulate the best results from each – a strategy which seemed to have been recognized at the time, and which worked. The raising of Lazarus was completed in 1519, when it was exhibited, less formally in Rome and more formally in the Vatican (once with the Transfiguration); after which it made its way at some unspecified time, probably by sea, to Narbonne. 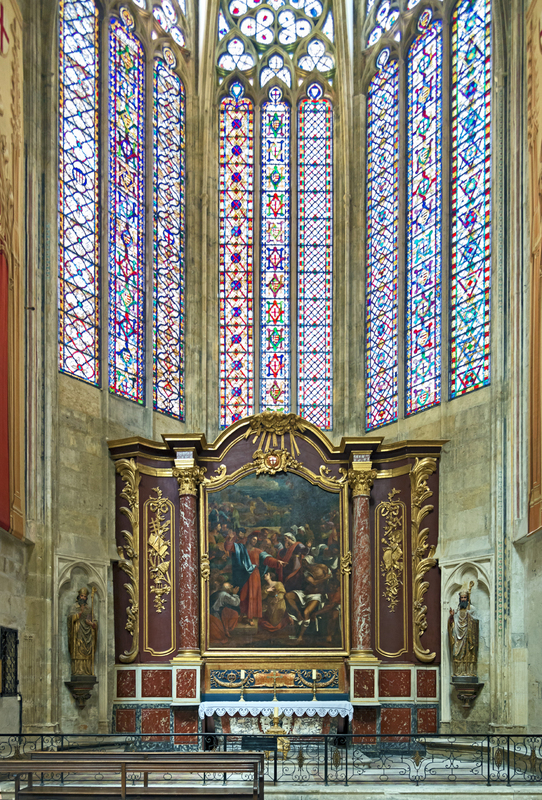 It seemed appropriate that it should be installed there, even without Raphael’s altarpiece, as the cathedral in Narbonne was thought to possess relics of Lazarus . Quite a lot is known about the creation of Sebastiano’s painting because of letters written by him to Michelangelo (who had provided him with studies for some of the figures), and also from other correspondents’ letters. Leonardo Sellaio, for instance, reported to Michelangelo that Sebastiano had been advanced the money to have all the woodwork made ; from Creighton Gilbert’s work on contracts between clients, carvers and artists in the early Renaissance, it is clear that ‘the woodwork’ comprises both the panel to be painted and the frame, and that therefore as early as January 1517 Cardinal Giulio de’ Medici had given the artist money to sub-contract the provision of the wooden support and its setting. This implies that from the beginning the frame was intended to be impressively sculptural, as befitting client, subject and location. Sebastiano was worried that Raphael was manoeuvring to get the frame for the Lazarus constructed in Narbonne, and the picture sent off there to be framed; this would remove it from Rome before Raphael’s own painting was finished, destroying the element of competition which had been set up, and preventing both altarpieces from being judged side-by-side . 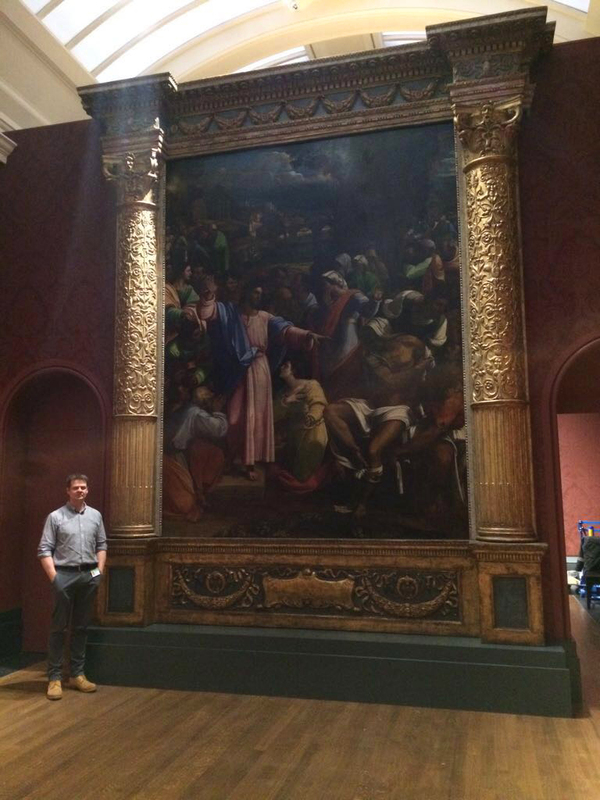 However, it seems that this did not happen, and that Sebastiano’s altarpiece was almost certainly framed in Rome. In the early 1980s Christa Gardner von Teuffel discovered that the predella panel of the original frame for Lazarus still survived in the cathedral of Narbonne, although the painting itself had been long gone. 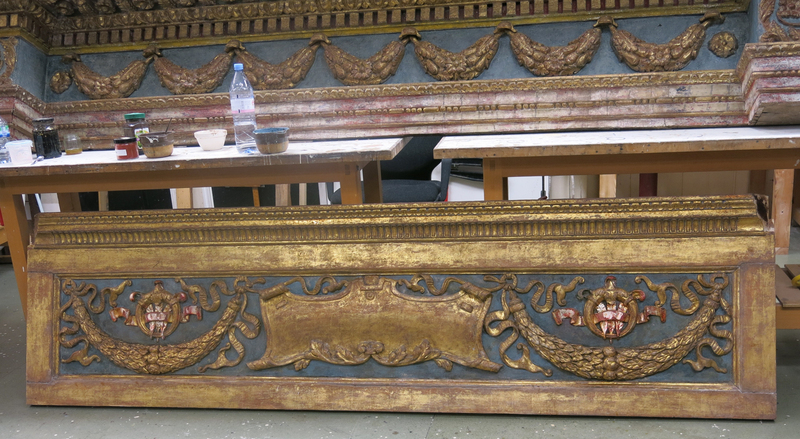 A copy of it had been executed by Carl van Loo, and the 16th century predella had been incorporated into the 18th century frame on this replica. This discovery obviously had implications for the original painting by Sebastiano, now in the National Gallery in London. The raising of Lazarus had remained in Narbonne throughout the 16th and 17th centuries, but in the early 18th century it had caught the eye of that collector’s collector, Philippe, duc d’Orléans, Regent for the infant Louis XV (1674-1723). The duc had inherited several small collections through his father, and in the last two decades of his life he greatly expanded these, acquiring major works – mainly through other French collectors, but also including a hundred & twenty-three paintings from Christina of Sweden, and some of Charles I’s, which contained the Mantua collection. His eventual collection numbered more than five hundred pictures, and was rich in Veroneses, Raphaels, Titians and Poussins. He had been trying to acquire the Lazarus since 1706 , and in 1722 he succeeded in buying it from the cathedral in exchange for money for repairs, the copy painted by Carl van Loo – and, presumably, the new frame. The predella panel may have been incorporated into that frame as (although unwanted by the duc) it bore witness to the history and patronage of the original painting. The Lazarus spent the next seventy years in the Palais-Royal, until it was sold, along with the rest of the collection, in the ferment of the French Revolution. In 1798 it was bought by the banker, John Julius Angerstein (1732-1823), and after his death was sold with 37 other paintings in his collection to the British government, to become the core of the embryonic National Gallery. Until a purpose-built gallery could be constructed, the collection remained on public view in Angerstein’s house in Pall Mall, where the watercolour (above) was painted. 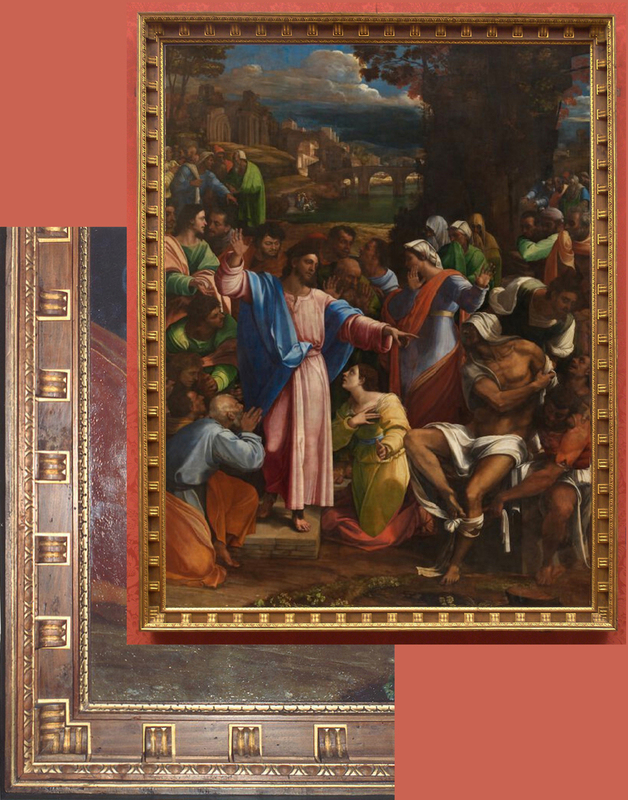 Sebastiano’s Raising of Lazarus is prominent on the right, displayed in what may well be the frame given to it by Philippe, duc d’Orléans. To place an early 16th century Italian altarpiece in a Baroque French frame was a method of ‘domesticating it’ (as far as such a term is applicable to the luxury of the Palais-Royal), and helping to integrate the whole collection. The same spirit continued to work in Angerstein’s collection, where paintings from other sources were framed, if not in antique, then in replica French Baroque styles. This arrangement continued until the new National Gallery building in Trafalgar Square was opened in 1838, when a gradual and piecemeal programme of reframing the more inappropriately-presented paintings would begin. 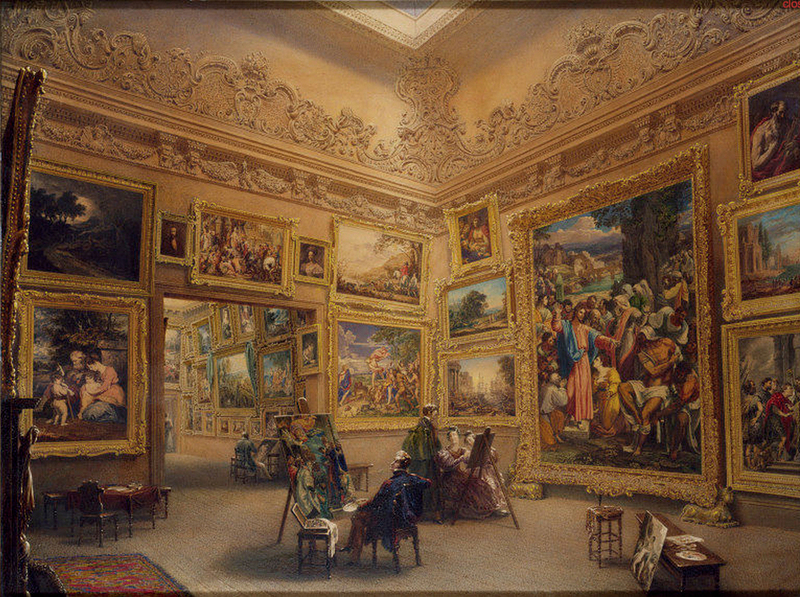 By 1861, when the engraving of a ‘New room at the National Gallery’ appeared in the Illustrated London News , the Lazarus had exchanged its Régence frame for a deep hollow NeoClassical pattern, decorated with moulded acanthus leaves, which seems to be much after the style used by Turner for his work (for example, on The Bridgewater Seapiece, c. 1801). This pattern was used for other frames in the Gallery, too. It was reframed again in 1967, under the supervision of Philip Hendy, at the end of his 21-year directorship of the National Gallery. 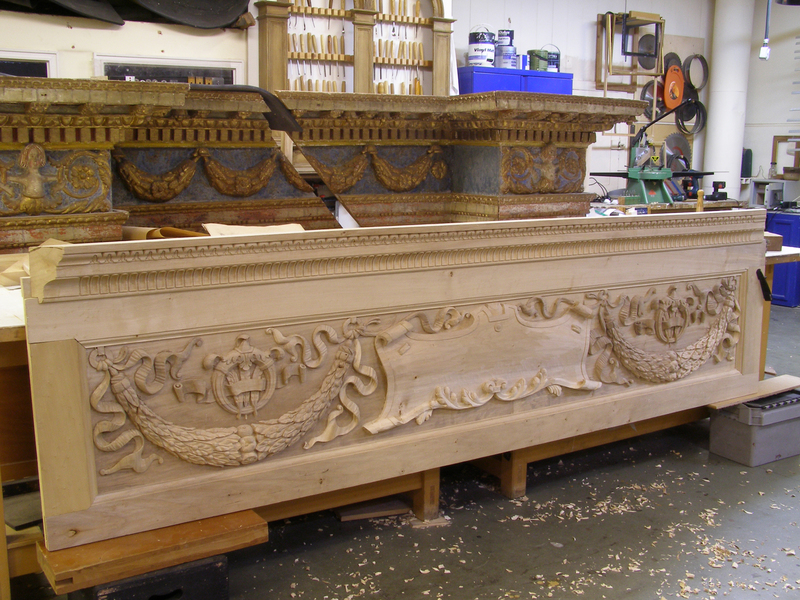 He had apparently bought some carved and parcel-gilt architectural mouldings in Italy, described in the Paul Levi survey of National Gallery frames as ceiling mouldings, of the late 16th to the 18th century; and these were transformed into an entablature frame in an approximation of Mannerist style. The painting remained in this setting until it was decided to create a more satisfactory frame for it, about seven years ago. The original predella left in Narbonne now became extremely important. Peter Schade, Head of Framing at the National Gallery , visited the Cathedral and studied this surviving panel of the frame in great detail. No other elements of it remained, and there was nothing in the church archives to indicate what might have become of the rest; it probably vanished during the Revolution. The predella, however, is notable for its decoration; it is carved in relief with a scrolled leatherwork cartouche at the centre and two pendant swags of bay-leaves and berries at the sides, centred with a vertical band of pomegranates, the swags being tied to the cartouche by serpentining ribbons. Pomegranates were a motif used on works commissioned by the Medici, probably ‘as a symbol of rebirth’ . Above each swag is the Medici family impresa, of a jewelled ring and a trio of coloured feathers, with an inscribed scroll threaded between them. ‘armorial device… that of Lorenzo de’ Medici’s father, Piero de’ Medici: a diamond ring with three ostrich feathers and a banderole with the motto SEMPER (forever)… The ostrich feathers are a symbol of steadfastness, as they cannot be disheveled no matter how hard the wind blows’. Functioning rather like the presence of a donor in a sacred scene, the impresa of the commissioning client was frequently painted or carved onto the frame of a late Gothic or a Renaissance altarpiece. Its appearance on the panel at Narbonne is particularly splendid, since it was designed to mark Sebastiano’s great retable as the gift of its powerful and prestigious archbishop – and presumably would also have decorated the frame of Raphael’s Transfiguration. The questions then arise, was the Transfiguration indeed framed like the Lazarus? and secondly, who made these frames? 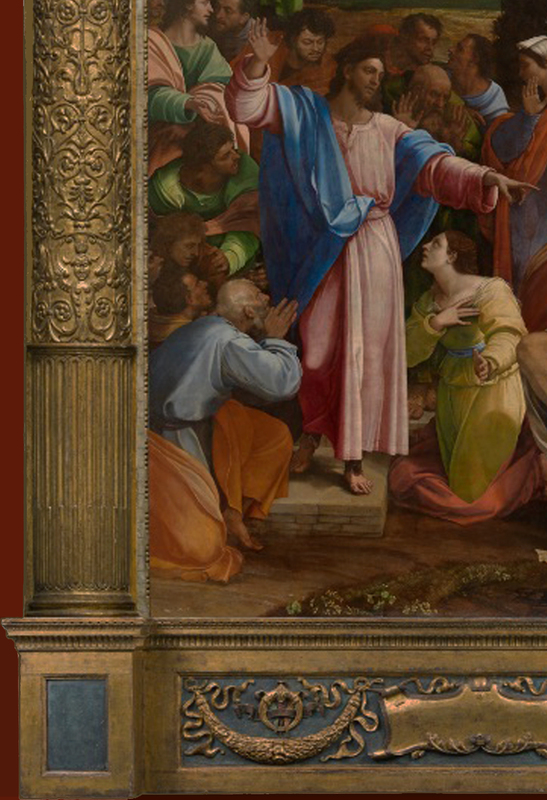 Logically, both paintings must have been intended to have been framed alike, since they were destined for the same church, and composed with mirroring lighting systems to enable them to be placed in mirroring oratories at the east end of the cathedral. 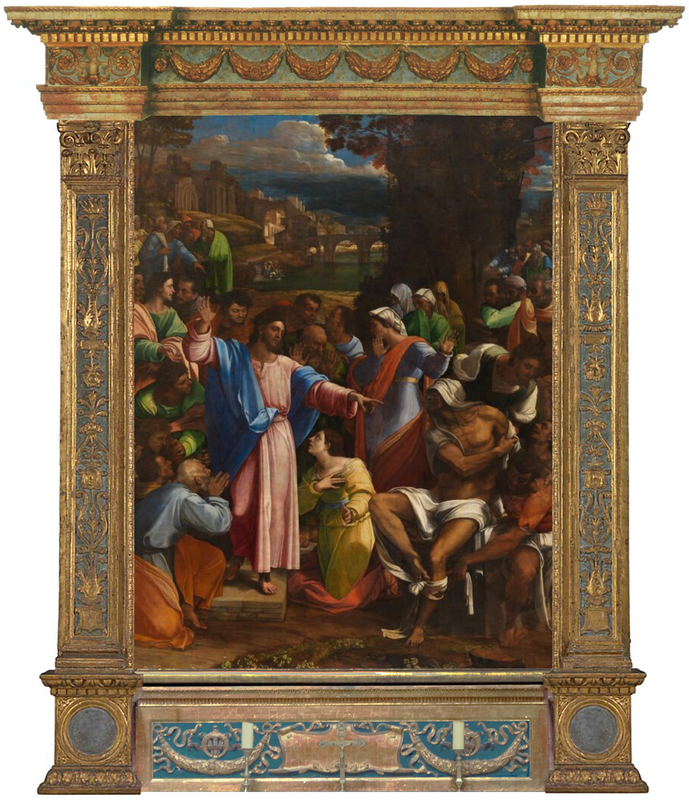 Sebastiano had gone to great political lengths to make sure that Raphael didn’t succeed in getting the Lazarus shipped off to Narbonne before his own painting was ready; he wanted them exhibited together, and he wanted his framed, so that it could be judged as a finished altarpiece. 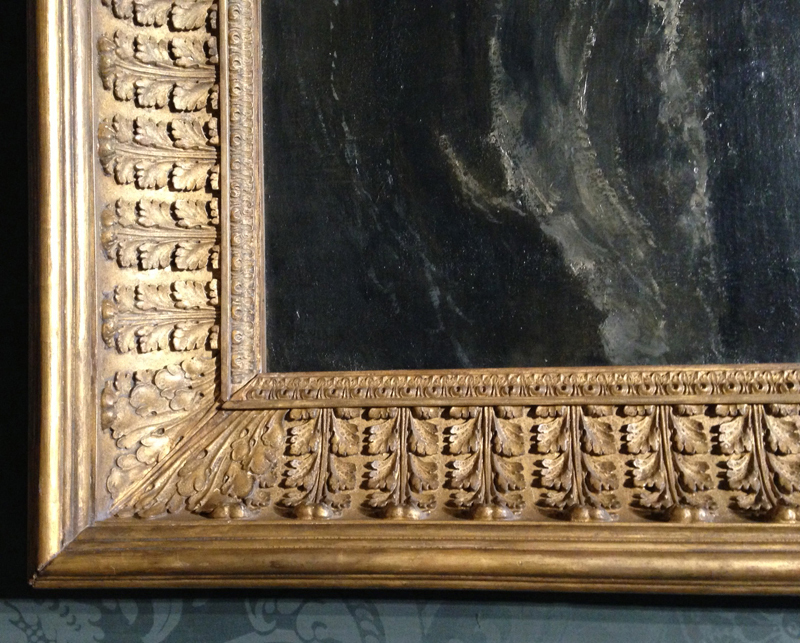 Frames were customarily made (in the best use of time) simultaneously with or even before the paintings they housed . It is therefore highly unlikely that the frames would not have been made together, by the same craftsman, and identically, given the nature of the commission. If they were exhibited together in Rome (as they were, in the Vatican), they must then both have been framed, as the comments were only on their mutual power and excellence – if one of them hadn’t been framed, this would surely have been noted. Some works on Raphael even describe Giovanni Barile as ‘his [Raphael’s] pupil’ , or state that Andrea del Sarto (1486-1530) was Barile’s pupil. The documented works that we know he was involved in include the Pope’s Loggia and Camera, 1517-19, and the Chapel of Nicholas V in the Vatican. The latter was in 1526, six years after the death of Raphael. The work in the Loggia and Camera is not specified; with regard to the Chapel of Nicholas V, this was frescoed from floor to ceiling by Fra Angelico, save only for the doors (now of plain panelled wood) , and the wall behind the altar (now bare), so it is impossible to know what Barile’s work consisted of, or its style . Vasari has done this elsewhere; for example naming Antonio Pollaiuolo as the architect of Innocent III’s Belvedere, where the documented architect is actually Jacopo da Pietrasanta . As well as being besotted with Raphael to the detriment of Sebastiano, he is notoriously sloppy about his facts. 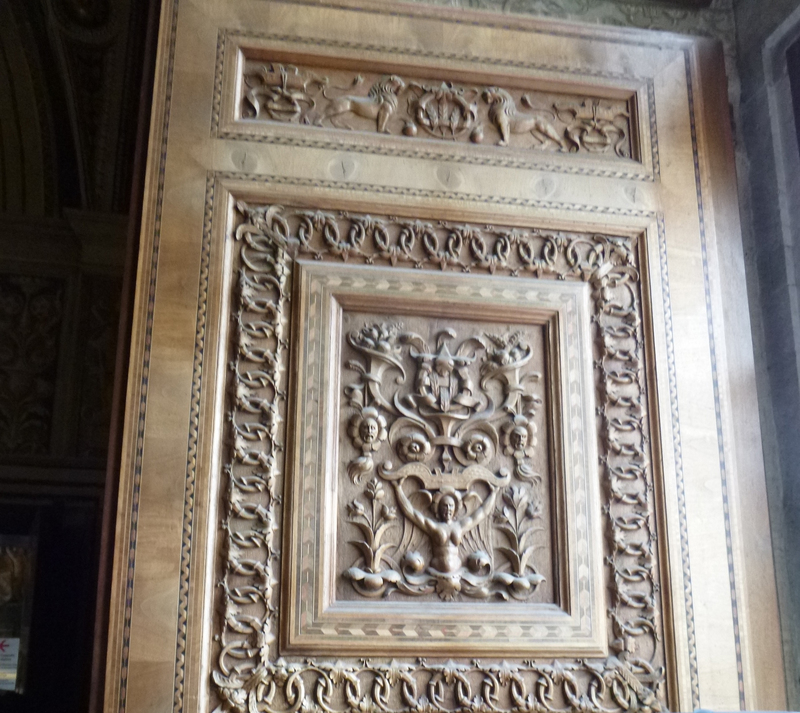 Certainly, if the two examples immediately above are compared – a carved wooden window shutter and one of the gilded and ornamented ceilings in Raphael’s Stanze – they do not seem to be by the same hand. 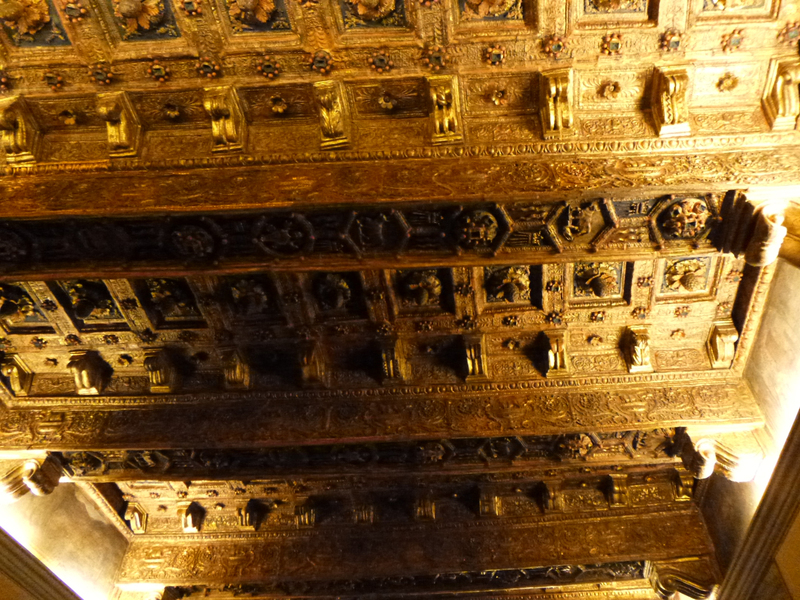 The ceiling in the Stanze has much more in common with the framework carved by Antonio Barili for the Siena Duomo (the third image above), in terms of its composition and use of motifs; although this may perhaps be slight evidence in favour of Giovanni Barile’s work there. There do not, however, seem at the moment to be any documented examples of Fra Giovanni working in the Vatican. Interestingly, the window shutter shown here does have a slight connection with the predella of the Sebastiano frame in Narbonne. 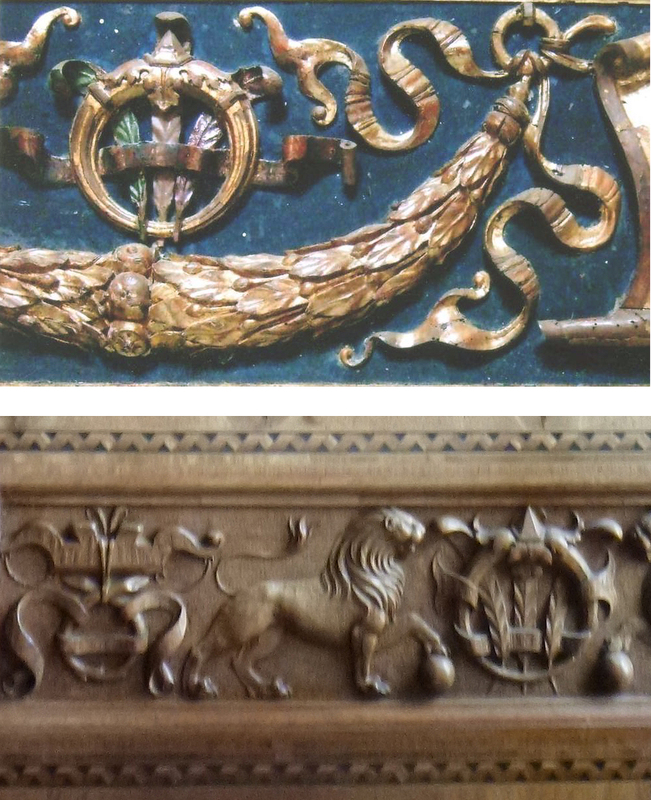 Below and above the central decorative panel are two further narrow panels, carved with beasts supporting the Medici impresa. 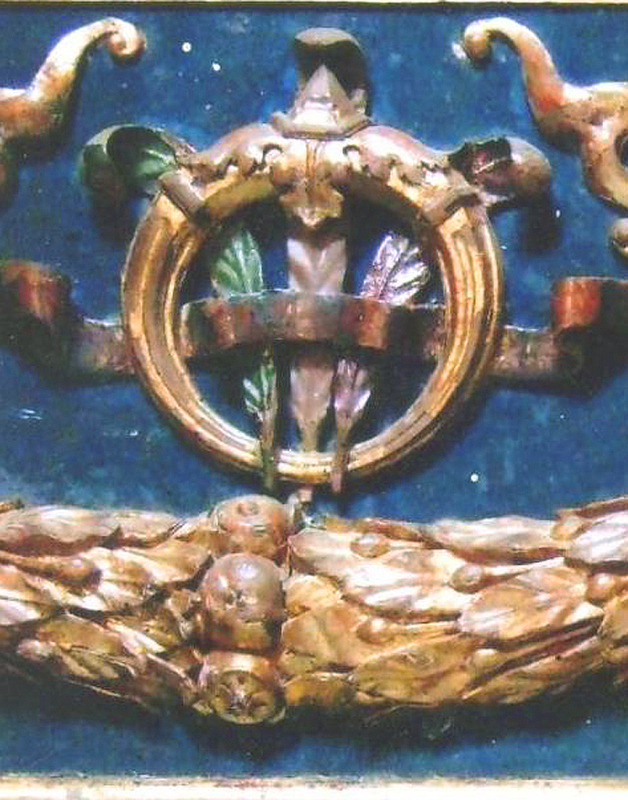 The latter is much closer, in the arrangement of the diamond ring over the feathers and the scroll inscribed ‘SEMPER’, as well as in the form of the ring – with its pointed stone set on two gilt acanthus leaves – to the impresa carved on the predella, than it is to other forms of the impresa such as in the desco da parto and the engraving from Paolo Giovio (illustrated above), which fall chronologically on either side of it, and are not therefore different through the amendments of time. 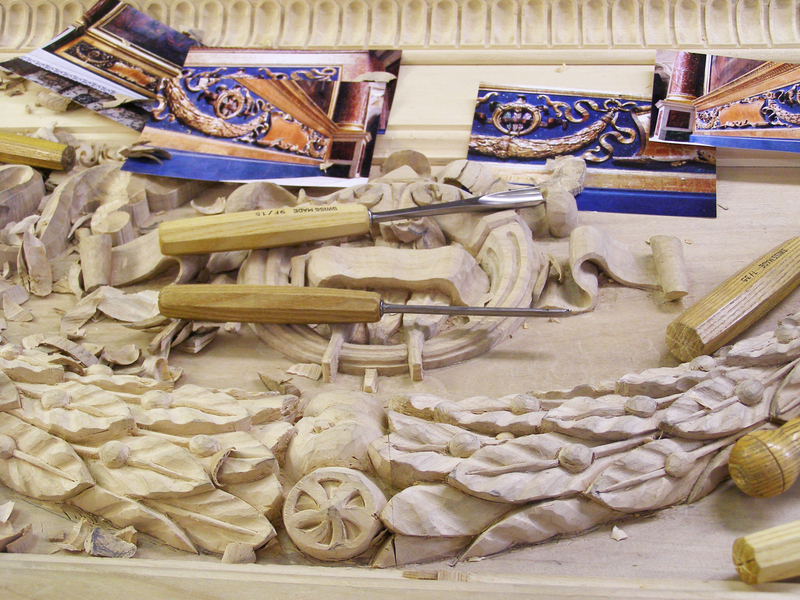 If Giovanni Barile carved the window shutters, such a similarity might thus support Vasari’s statement that he also produced the frame for Raphael’s Transfiguration, as well as that for the Lazarus. But it could equally well be possible to argue from these likenesses that, for instance, Fra Giovanni da Verona (who was respected by so many people, and by whom so many extremely accomplished works are documented) might perhaps have been responsible for the frames for these two prestigious works. Fra Giovanni da Verona (c.1457-1525), framed intarsia panels, sacristy of Santa Maria in Organo, Verona (mentioned by Vasari) . 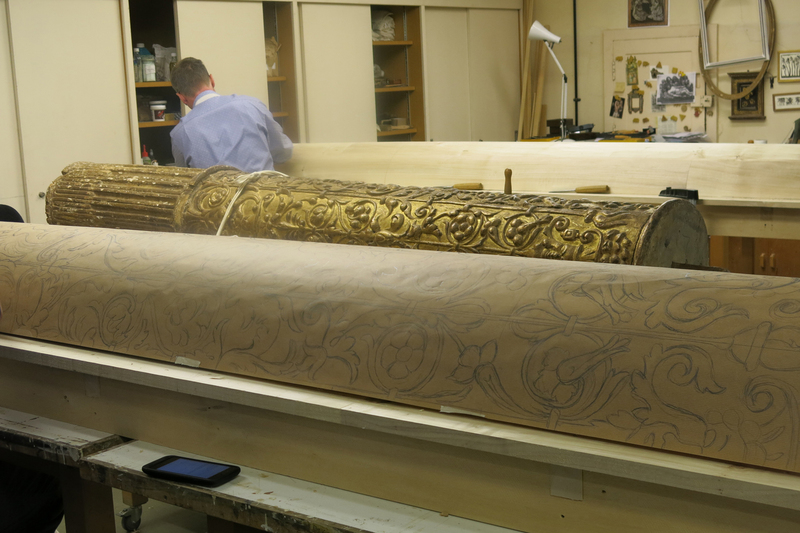 Photo: Michael S.
In Santa Maria in Organo, after all, he contrived a continuous carved aedicular framework for his trompe l’oeil marquetry panels, each section of which is like a altarpiece, framed by columns and an entablature. 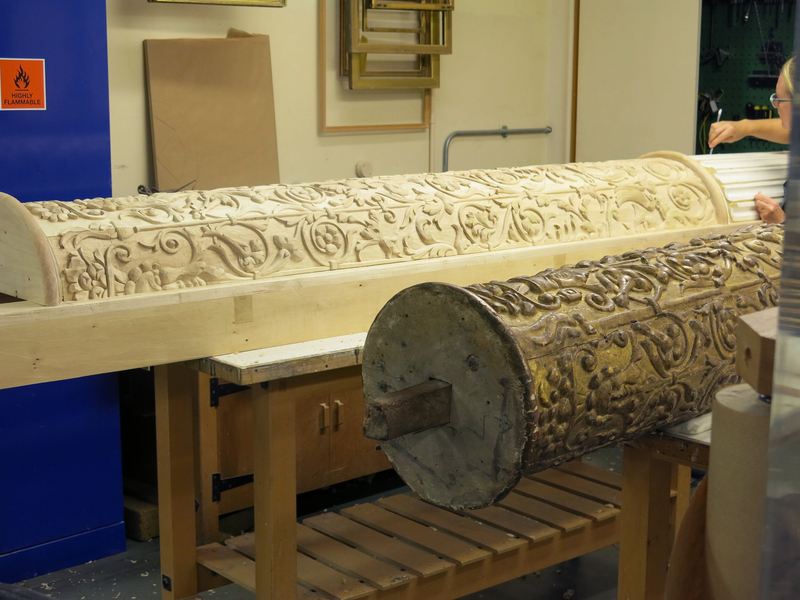 The lower sections of the columns are carved with trophies in shallow relief. 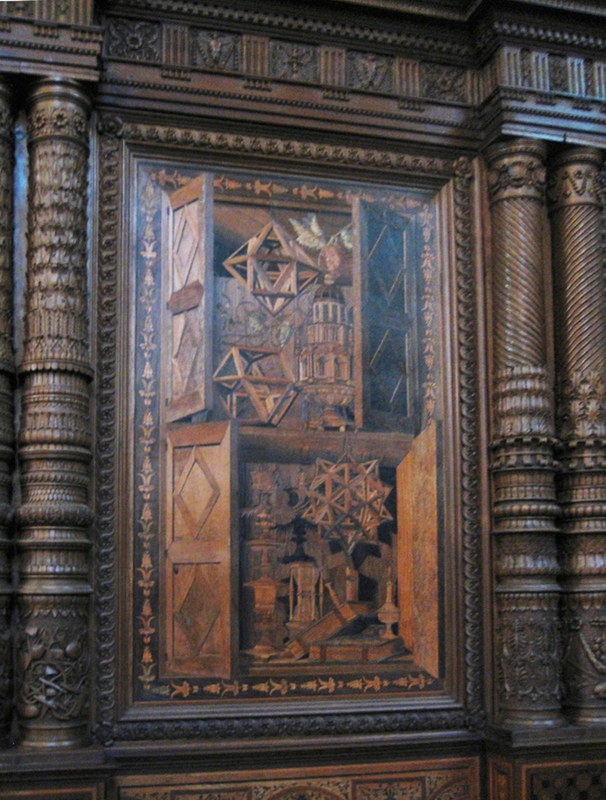 These reflect the type of architectural frame which Christa Gardner von Teuffel must have envisaged, with ‘projecting vertical members’ containing the predella panel at the base of the original Lazarus frame, rather than (say) the cassetta style of altarpiece frame, with an encircling architrave border between a small entablature and crest, and a staggered predella descending to an altar frontal, which was produced for Raphael’s St Cecelia in San Giovanni in Monte, Bologna. 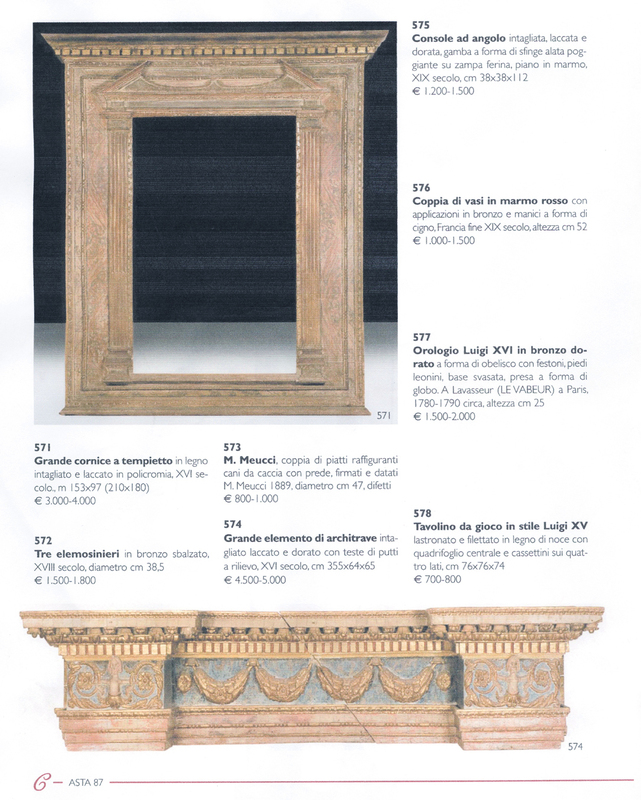 The latter has always traditionally been supposed to have been carved by Andrea Marchesi di Formigine, but Massimo Ferretti credits this frame too to Giovanni Barile . ‘…de mandato [camerale] sub die xxvn julii preteriti, magistro Baverio pictori, pro pictura cuiusdam tabule quam S. D . N. donavit ecclesie Sancti Petri Montorii, que est deaurata in totum de manu dicti Beveri duc.-215 b[ol]. 5’ . 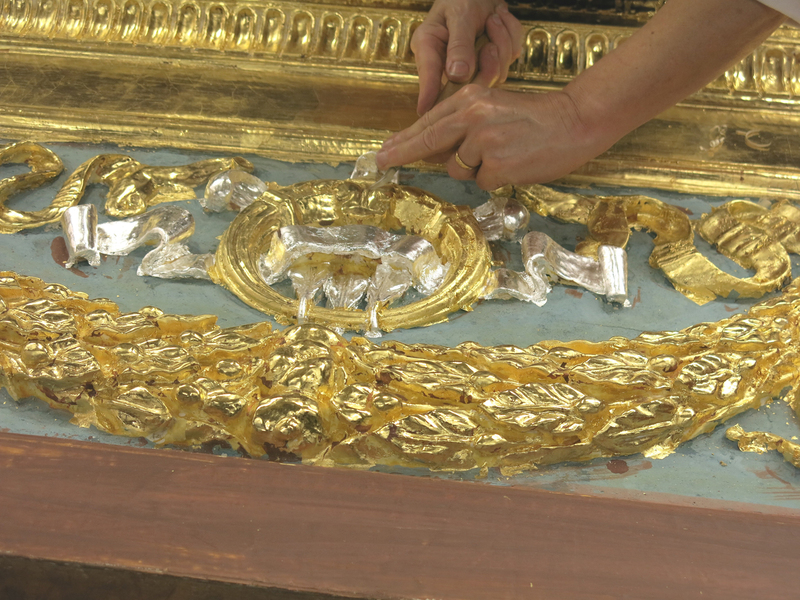 This was almost certainly not the parcel-gilding of a polished walnut frame, but an overall gilding (it was ‘completerly gilded’) in the normal fashion of a Renaissance altarpiece. The accuracy in the 18th century document of crediting Raphael with making the frame need not be questioned at all, as it is obviously so completely wrong. 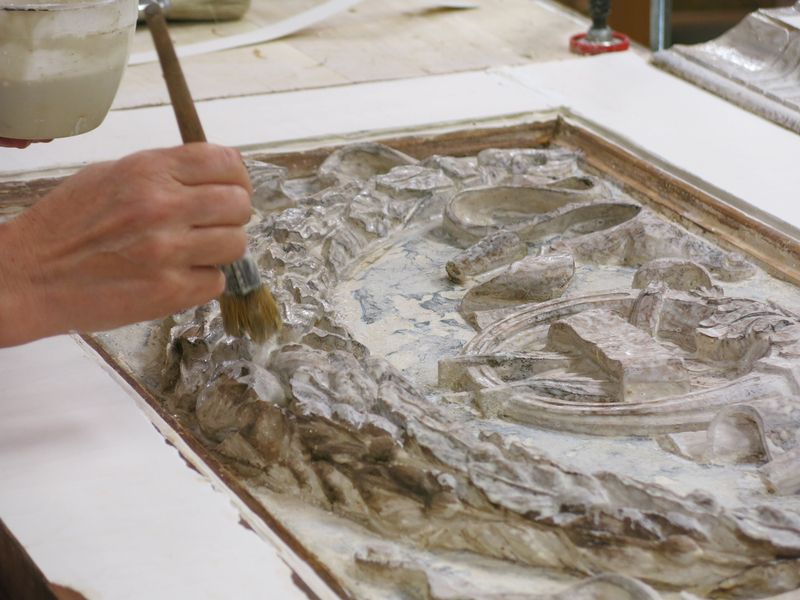 Considering the body of his work in a lifetime of 37 years, he (like Michelangelo) had no time to be designing, carving or gilding frames, especially when there were so many specialists around to do it for him. 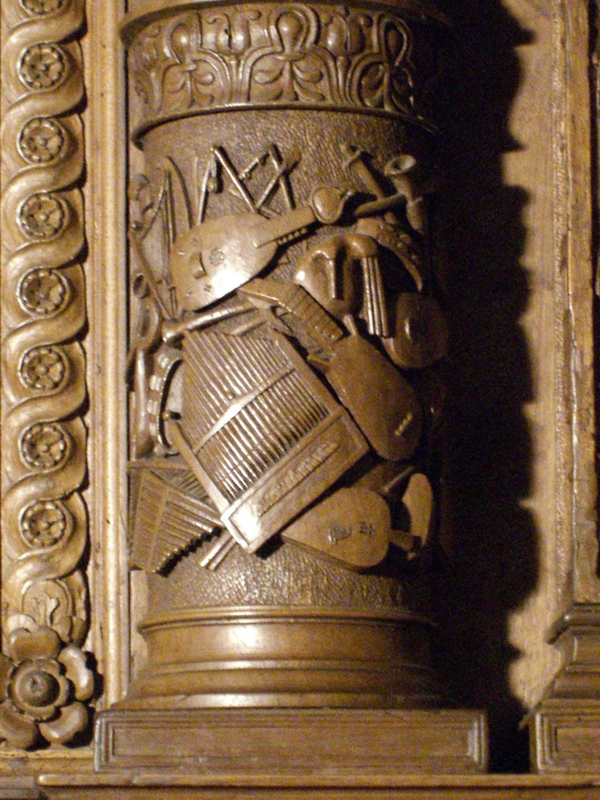 However, what remained after the altarpiece was taken down to be copied sounds very much like what was left of the Sebastiano frame when the duc d’Orléans had abstracted the painting: the Medici coat of arms (or impresa) at the foot of the two lateral columns – in other words, the predella panel. It would be interesting to know whether Baviera de’ Carocci had earlier gilded the frame of the Sebastiano for Giulio de’ Medici (probably not, if he were Raphael’s assistant; see Vasari), and whether in 1523 he coloured the Medici impresa on the predella of Raphael’s altarpiece in an echo of that other frame. Nothing at all now survives of the original frame of the Transfiguration, and all that remains of the Lazarus frame is the original predella panel in Narbonne. 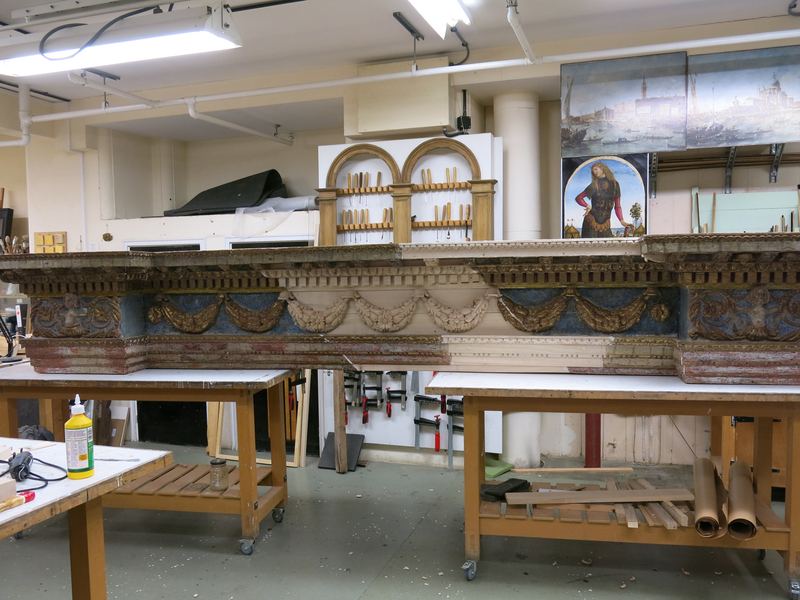 Also remaining – until recently – was the riddle of how to reframe effectively and appropriately one of the National Gallery’s major works, which was currently housed in recycled ceiling mouldings. 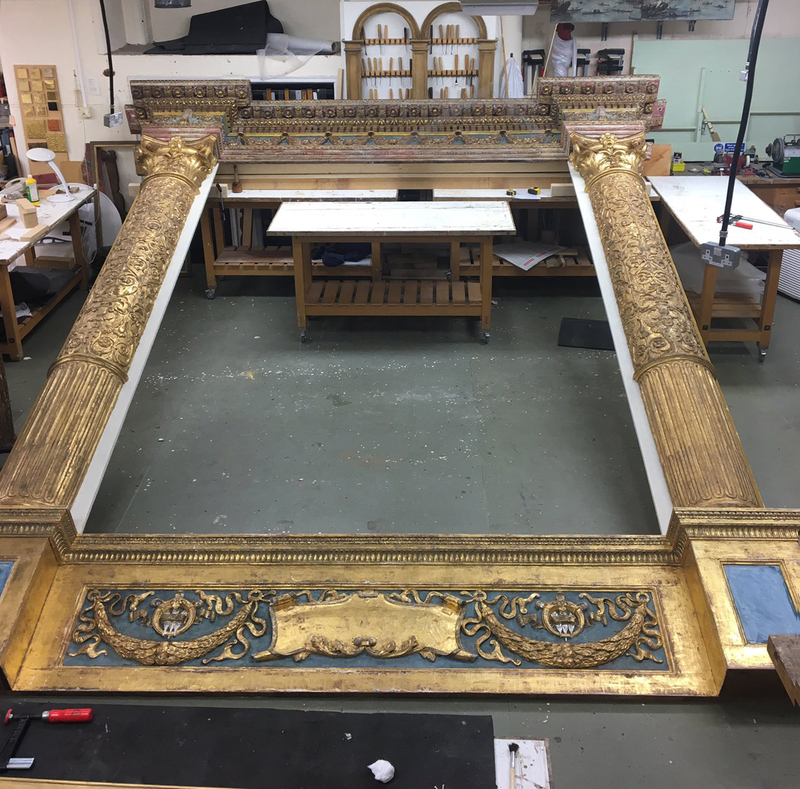 In February 2009, an antique architectural element on a grand scale – an entablature measuring three and a half metres across, carved, gilded and polychromed – came up for auction in Genoa, and was acquired by Peter Schade for the framing department of the Gallery. It had previously been cut diagonally across the centre for storage purposes, which was fortuitously not the unhappy event it might have seemed, since the original width of the frieze was proportionally far too narrow for its depth and the central stepped-back bay of the entablature could be widened to fit the Sebastiano. 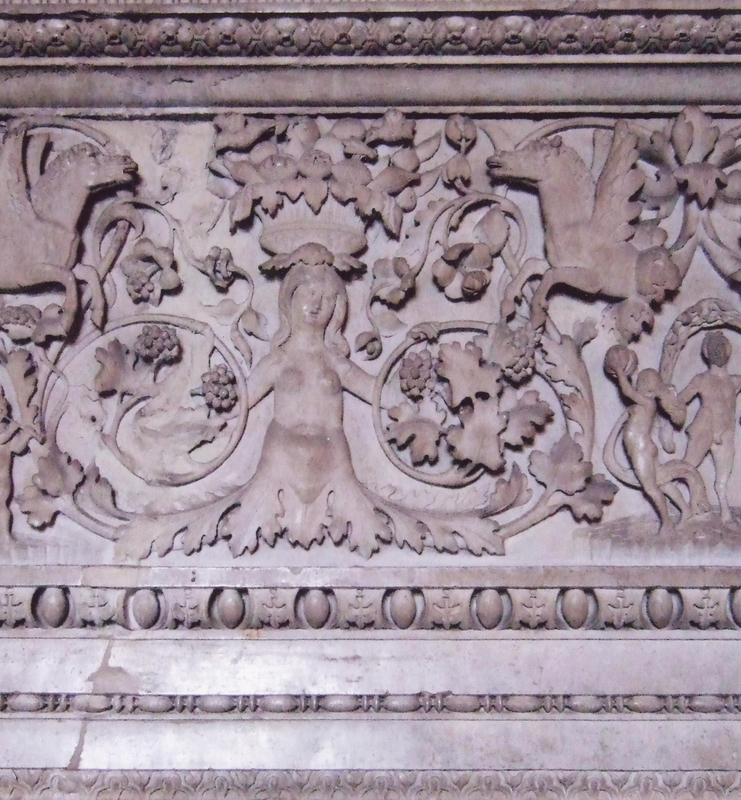 The decoration of the entablature was tantalizingly reminiscent both of the ornament on the Lazarus predella, and of carvings in the Stanze: the small morphing figures at either side of the frieze were very like the figure on the window shutter and on the chimneypiece (above), and the swagged bay leaves echoed those on the predella. The first reframing idea, therefore, was to copy the predella very accurately; to extend the entablature to fit the painting; and to carve supporting pilasters to produce a complete altarpiece. 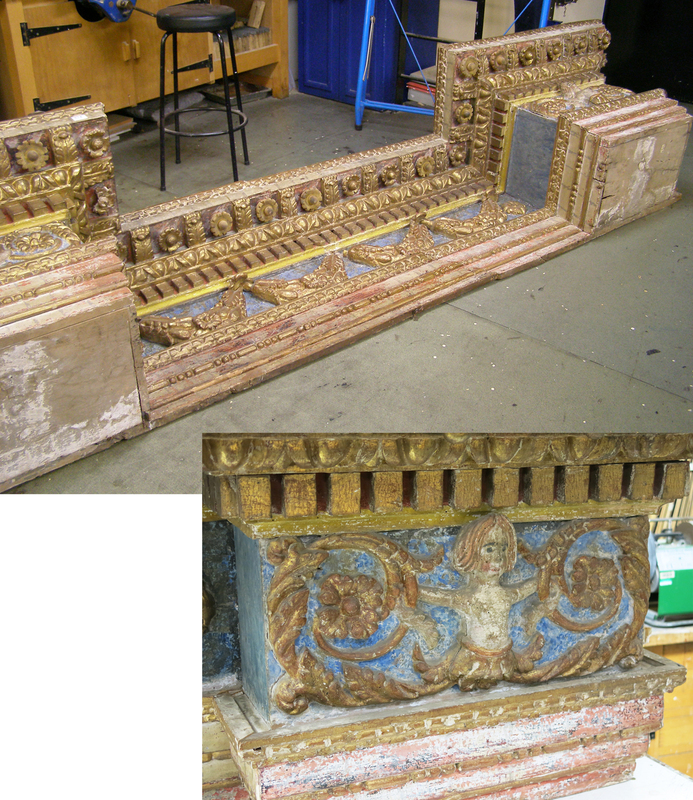 The initial mock-up for this arrangement used the first two elements, and combined them (just to provide an example) with copies of original pilasters from the same period which were already in the Gallery, having been used to create a thoroughly researched and meticulously designed part-antique, part-replica altarpiece frame for Leonardo’s Virgin of the rocks. 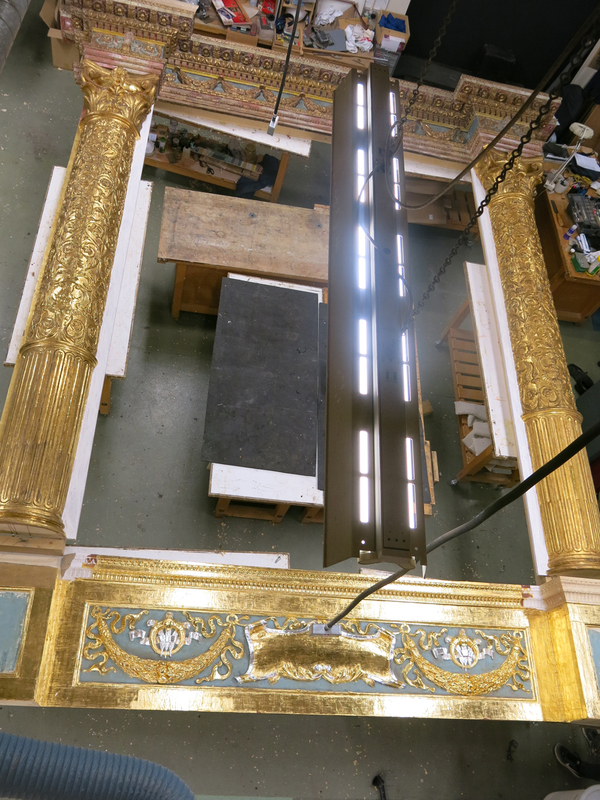 The project of recreating an architectural frame for the Sebastiano, returning it to its original Roman glory, was supported throughout the project by John Lessore, Artist Trustee at the National Gallery, in a striking act of imagination, creative drive and faith in the head of the framing department. 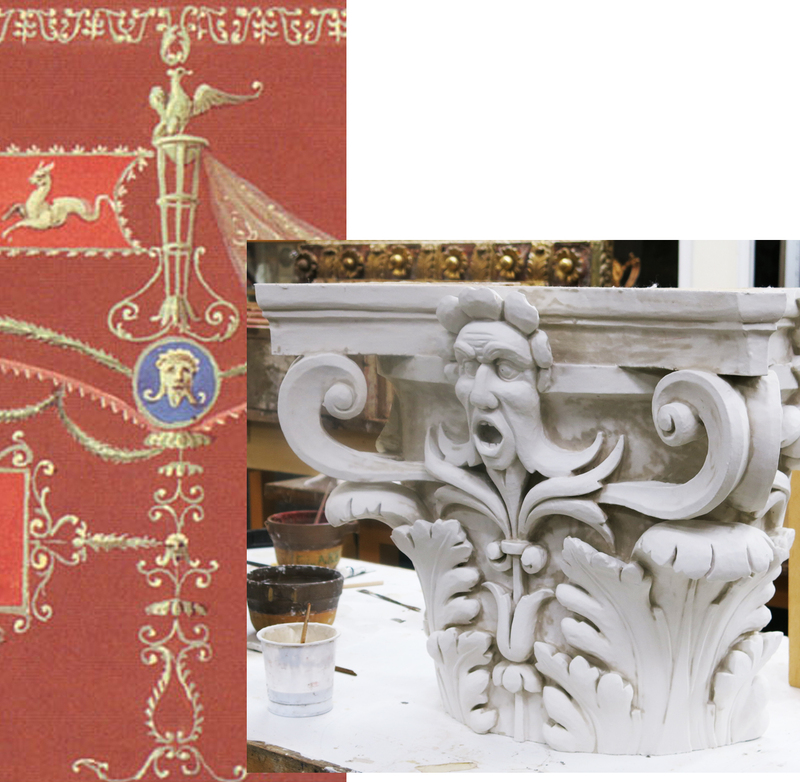 The predella in Narbonne was copied as an exact replica – carved by Peter Schade to the dimensions of the original, gesso’d, recut and gilded, and the polychromy carefully reproduced, from the blue ground to the coloured feathers in the impresa. 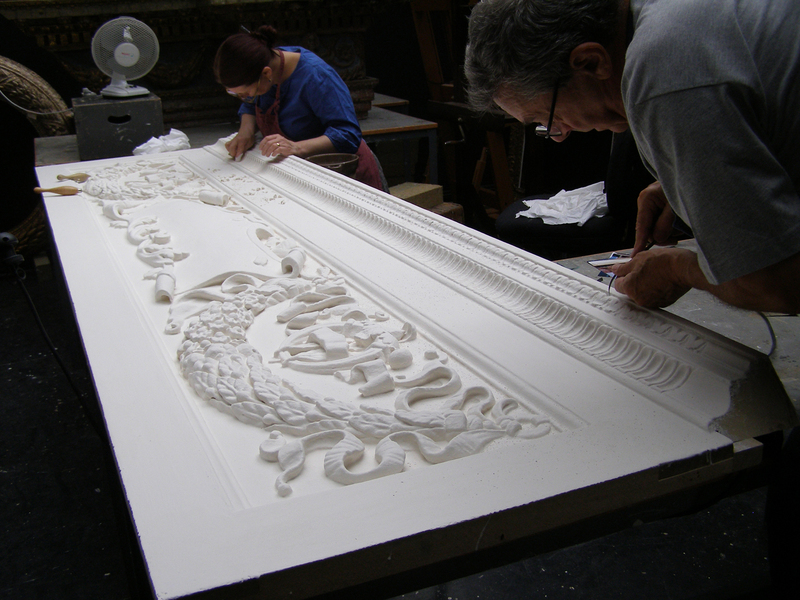 The entablature was separated diagonally back into its component parts and a new central portion was carved, extending the four bay leaf swags remaining from the original frieze to seven, and supplementing the cornice and supporting mouldings. 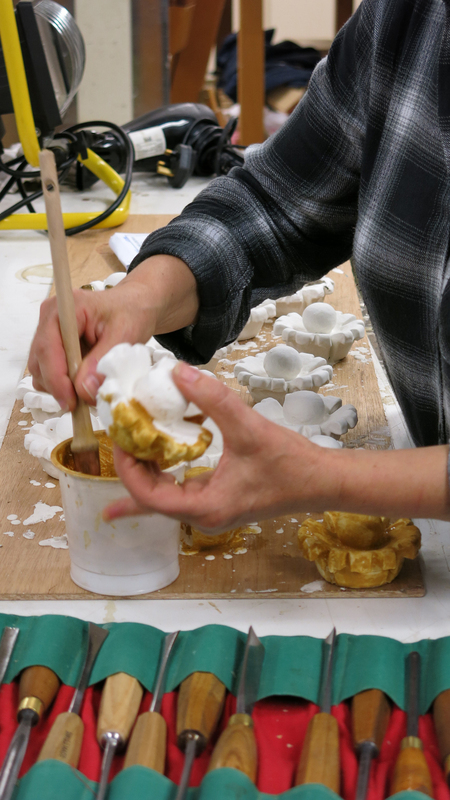 New and replacement flowers were carved and finished – like a tray of fairy cakes – to match those on the underneath of the cornice. 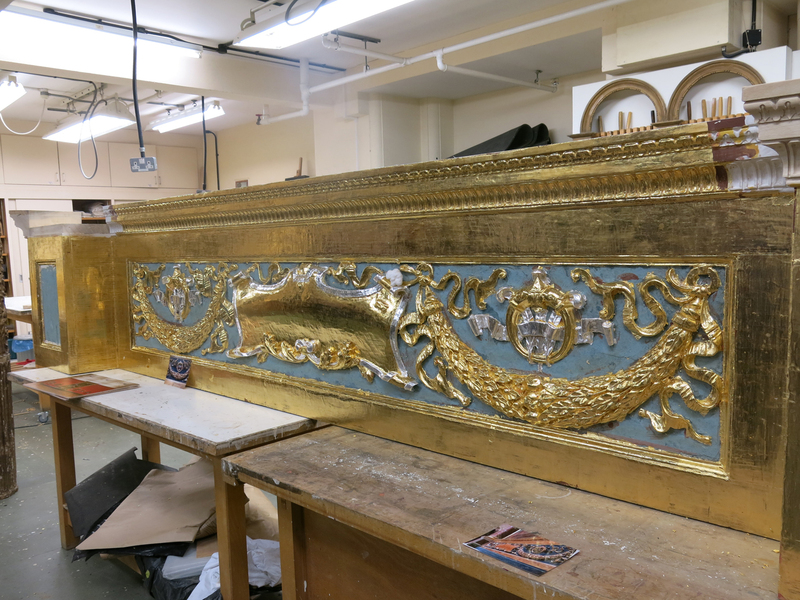 The colour and gilding on the predella passed through various stages of a rigorous process of distressing and ageing, so that all the new portions would eventually match the original finish. 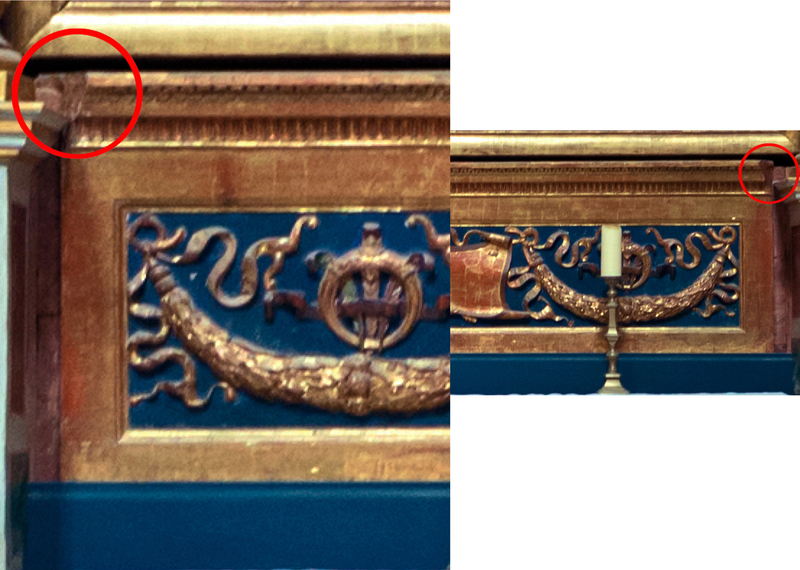 However, at this point it became clear that this was not going to happen, and that the spectrum of colours across the predella, including the areas of gold and silver leaf, was out of key with that of the entablature, as can be seen in the photograph above. This is a dilemma familar to artists and craftsmen in every medium; is it better to continue, and try to correct the work that has been done, or to accept that it can’t be wrestled into shape, and to start again, having learnt a great deal from the first attempt? It takes a lot of courage to go back to the beginning of a whole stage in a project, but this was too important to do otherwise. 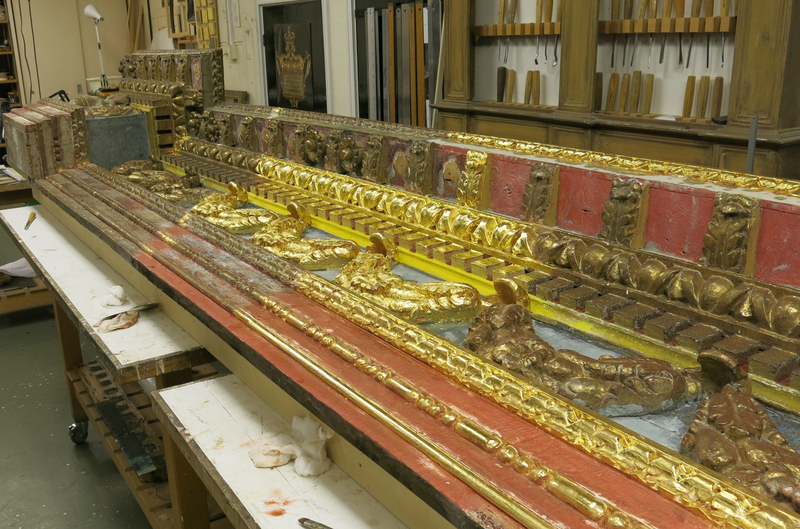 The predella was stripped right back, regessoed, recut, regilded, and the polychromy reapplied. 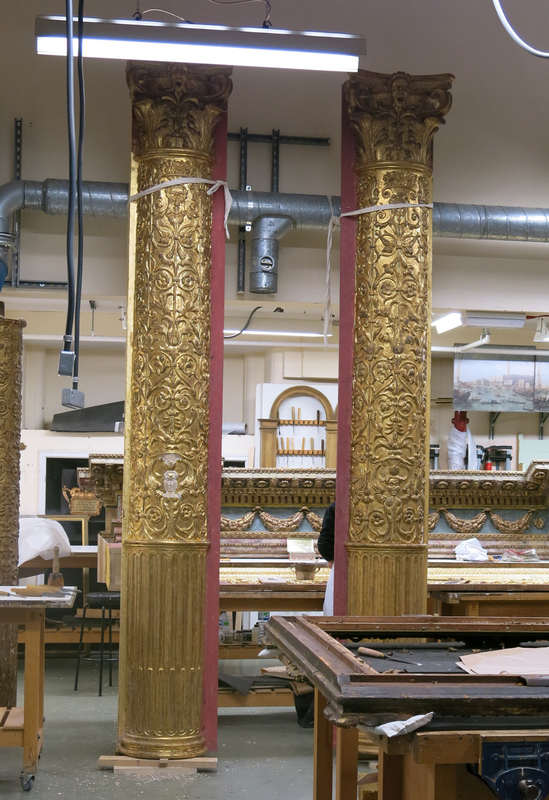 Whilst the top and bottom of the frame were being dealt with, the Gallery frame store had yielded a completely fortuitous treasure: a pair of antique carved giltwood columns, of the same period as the other original framing elements, which had been acquired from the framemaker and restorer Paul Levi. These were much too short for the scale of framework demanded by the painting, but they provided an exceptionally appropriate pattern, both chronologically and stylistically, for the type of architectural setting indicated by the predella panel. They were therefore scaled-up and copied as half-columns, engaged with an inner border at the sight edge to give a suitable interval between the frame and the painting. 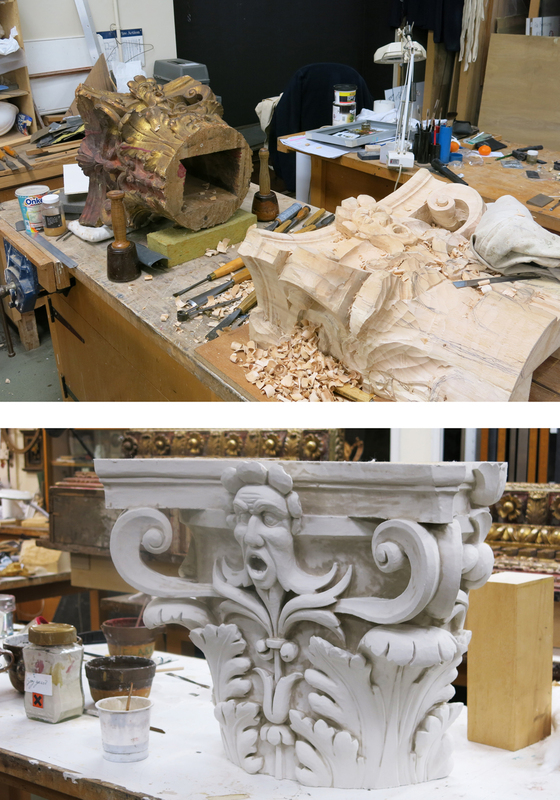 The grotesque masks on the capitals of the antique columns demonstrate the influence diffused in the late 15th and early 16th centuries by the decoration in the Domus Aurea (64-68 AD). Like the morphing figures on the entablature, they are bound intimately to the scheme of decoration used by Raphael and his colleagues, including Giovanni da Udine (1487-1564). With other artists who were their peers, they had all explored the cave-like interiors of Nero’s golden palace, rediscovered under its grassy Roman barrow in 1480, and frescoed with a sophisticated programme of delicate arabesque ornament and grotteschi. 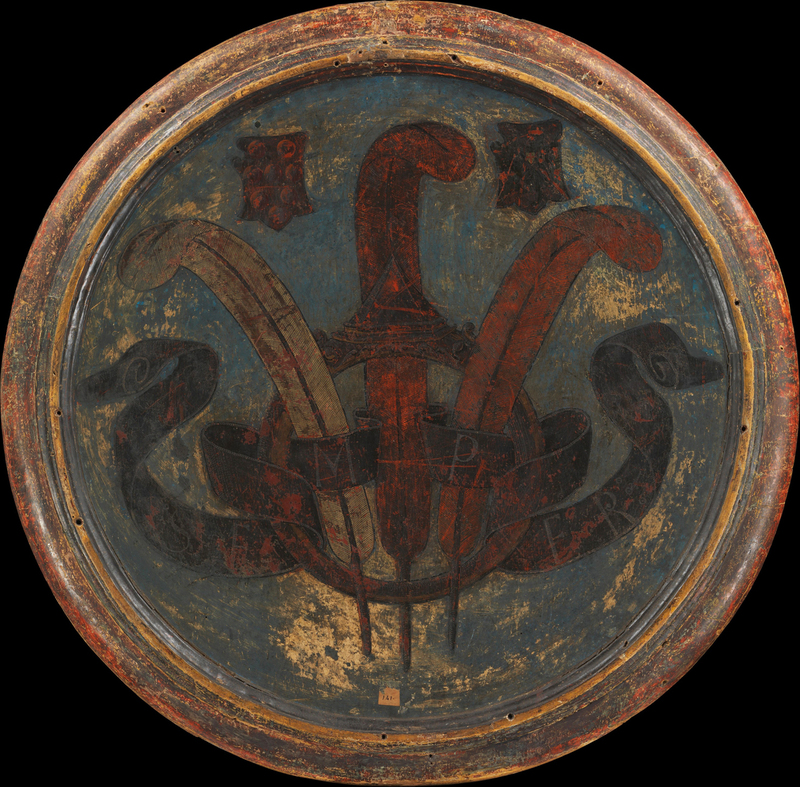 This decoration, possibly first used in a Renaissance programme of frescos by Filippino Lippi, was still in a very good and highly-coloured condition when it was found; it has since degraded catastrophically and been subject to major efforts at restoration, but it was recorded (amongst other reproductions) in the 18th century, in a series of 60 plates published by Lodovico Mirri in 1776-78 . 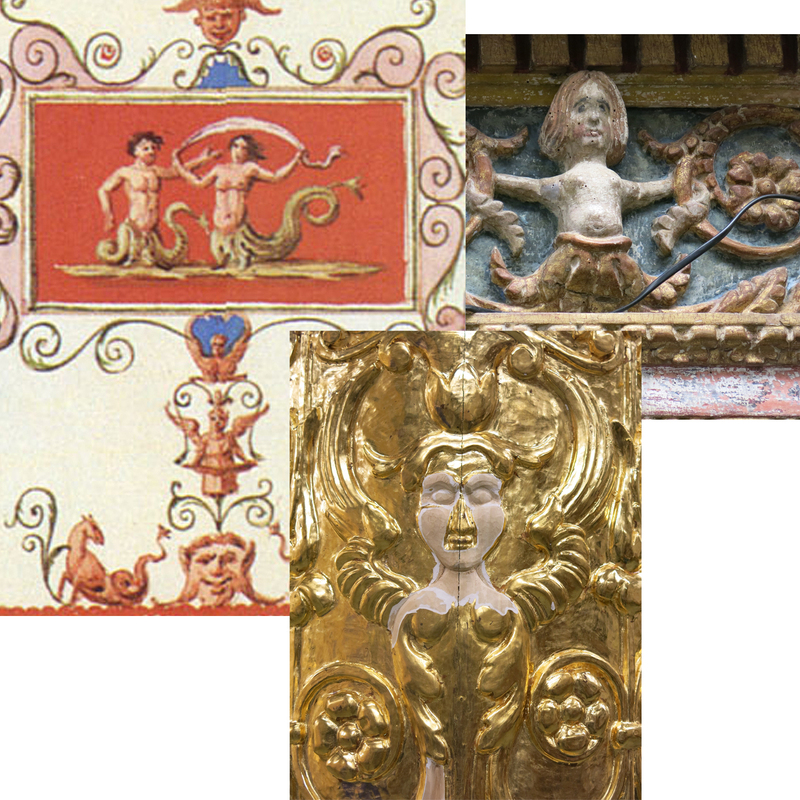 Its influence can clearly be seen in the ornament of the antique columns used as models for the Sebastiano frame; on the capitals, the mask with open mouth, crimped petal-like hair and curling locks like moustachios is plainly drawn straight from decoration in the Domus Aurea, as are the delicate pierced scrolls and leaf fronds around it. The ornament of the columns is thus closely related to the ornament of the antique entablature, the figures on the frieze of which also derive from the Domus Aurea. The use of a similar decorative programme on the walls and ceilings of the Raphael Stanze in the Vatican suggests that two such major altarpieces commissioned by Cardinal Giulio de’ Medici – one of them from the artist in charge of the Stanze – would almost certainly have been framed in the same style. 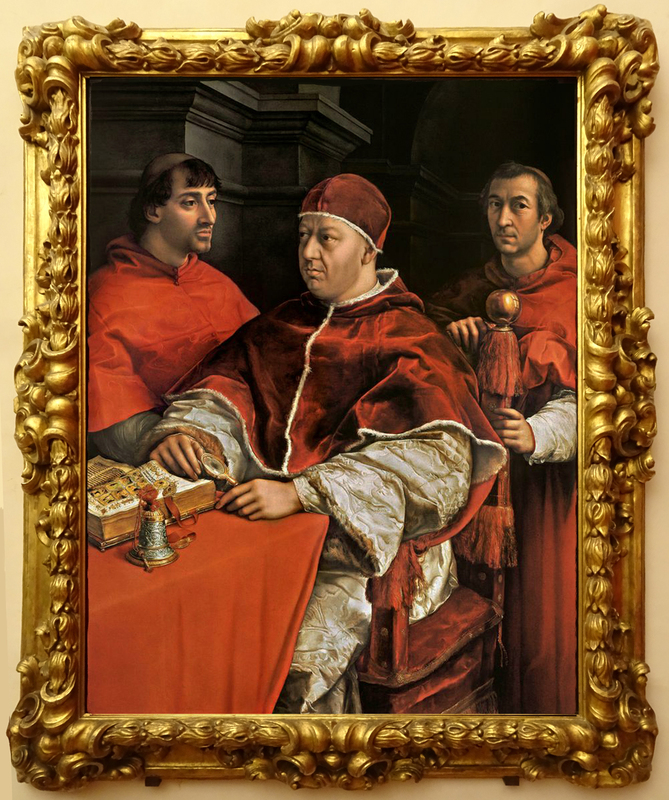 The intended location, in Narbonne, would not have affected the style of frame; it would probably have strengthened the Cardinal’s wish to provide the most up-to-date and splendid Italianate setting to memorialize him in his French archiepiscopal see. 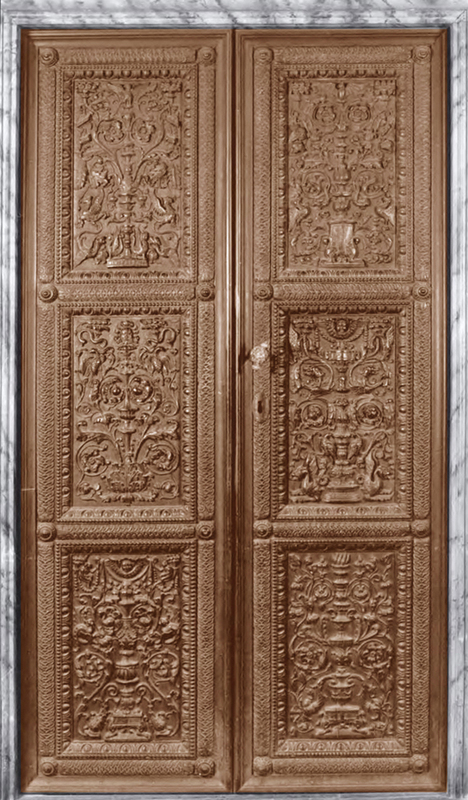 The story that Giulio de’Medici had been raised by Antonio da Sangallo until he was almost seven – in the family of a noted group of woodcarvers and architects, who worked for Lorenzo the Magnificent – is not completely proven, but it is an interesting idea which, if true, would lend even greater force to the probability that the frames of the two altarpieces were a pair, were particularly splendid, and were carved by a craftsman with a large body of exquisite and documented work behind him . Giuliano de’ Medici may have been betrothed to Giulio’s mother, according to some sources. Various contemporary accounts repeat the fact that she was a member of the Gorini family, and unmarried. 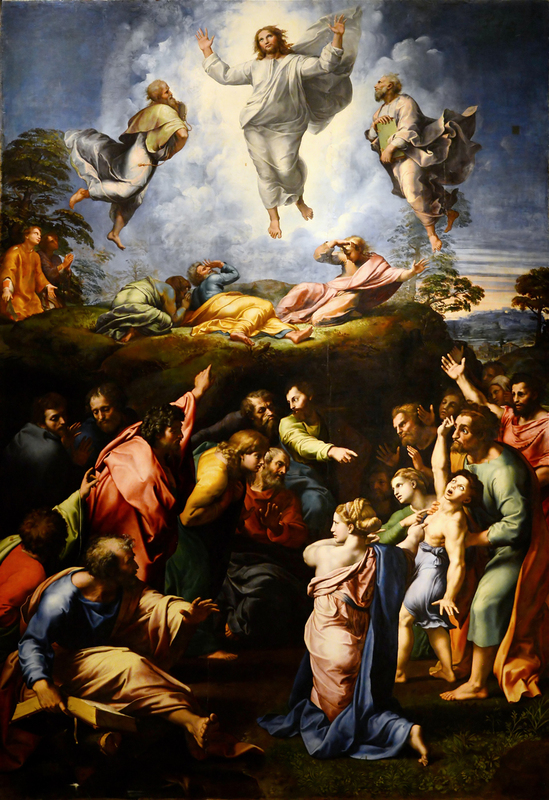 Costanza Barbieri points out that we do not know whether there was originally just the single commission of The Transfiguration from Raphael; or whether both the latter and The raising of Lazarus had been commissioned from him, until Michelangelo persuaded Giulio de’ Medici to give Lazarus to Sebastiano; or whether the Cardinal had always intended that there would be two panels by different painters. Costanza Barbieri, ‘The competition between Raphael & Michelangelo, and Sebastiano’s rôle in it’, in Marcia B. Hall, The Cambridge companion to Raphael, 2005, p.160. Raphael’s commission seems to have been prior to Sebastiano’s. See Domenico da Terranuova’s letter to Michelangelo, 28 (?) July 1518, John Shearman, Raphael in early modern sources: (1483-1602), vol. 1 (1483-15420, Yale University Press, 2003, p. 358. With thanks to Louisa Davey’s research. See Sheryl Reiss, Cardinal Giulio de’ Medici as a patron of art, 1513-1523, PhD. dissertation for Princeton University, June 1992, note 141, p.251 (see p.235). See Creighton Gilbert, ‘Peintres et menuisiers au début de la Renaissance en Italie’, Revue de l’Art, 1977, no. 37, pp. 9-28; translated as ‘Painters & woodcarvers in early Renaissance Italy‘. DIVO PETRO PRINCIPI APOSTOL. JVLIVS MEDICES CARD. VICECANCELLARIVS D.D. ANNO D. MDXXIII’ – but see below. The altarpiece was in San Pietro in Montorio by 1522/23. John Shearman, Raphael in early modern sources, vol.1, p.742. Italian Encyclopaedia, entry on Antonio Barili. ‘In designs for tarsia-work and wood-carving he [Raphael] was especially skilful ; witness the magnificent doors and shutters of the stanze executed by his pupil Giovanni Barile of Siena.’ Encyclopaedia Britannica, 1902, ‘Raphael‘. Barile was appointed, by a Breve of Pope Leo X, to the Fabbrica of St Peter’s in December 1514, but only for making models and ‘centering’ (Shearman, ibid., p.188). 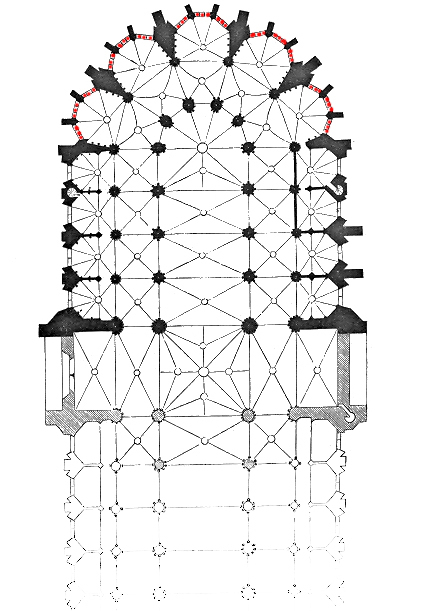 When Raphael and Fra Giocondo designed models for St Peter’s, however, it was the architect, engineer and supplier, Giuliano Leno, who was paid for them in 1521 (ibid., p.677, where Shearman indicates that Barile’s rôle was a ‘routine responsibility’). Barile was the Pope’s carpenter from 1517-19, and was paid for unspecified work in the Pope’s Loggia and Camera (ibid., p.455-56). See Sheryl Reiss, op. cit., p.10, & note 71, p.72: ‘…fifty gold ducats paid to master Giovanni Barile to good account for the work that he has undertaken to execute in the choir of the Chapel of Nicholas.’ (Archivio di Stato, Conventi Soppressi, 102, 327, c.50). Italian Encyclopaedia, entry on the Vatican. Vasari, op. cit., ‘Life of Raphael’. Fra Giovanni’a dates were actually 1456-c.1525, so he would have been in his mid-sixties when the two frames needed to be made. Massimo Ferretti, ‘”Con l’ornamento, come l’aveva acconciato”: Raffaello e la cornice della Santa Cecilia’, in Prospettiva, 1985, n. 43, pp. 12-25. Ibid., p. 781; Vatican City, ASV, Camera Apostolica, intraitus et exitus 561, fol. 181v. Shearman adds that ‘ Magister Baverio is Baverio Antonii de Carocciis of Parma, first recorded in Raphael’s circle [1515/10]; Giulio Romano was a witness at his marriage, 29 January 1523 (Bertolotti [1881/1] 63). Deaurata: a shorthand of the period which usually means, as it must here, gilding the frame…’ Baveria de’ Carocci was a painter and gilder who turned to engraving and publishing, producing a set of prints of twenty classical gods and goddesses in 1526; see Luba Freedman, ‘Argicida Mercurius from Homer to Giraldi and from Greek vases to Sansovino’, MAAR, 59/60, 2014/15, p. 230. Vasari calls him ‘Il Baviera’, says that Raphael gave him a set of his own engravings, thus provoking a glut of Italian engravers, and also notes that Baviera was ‘the guardian of a certain lady, to whom Raphael was attached till the day of his death’. 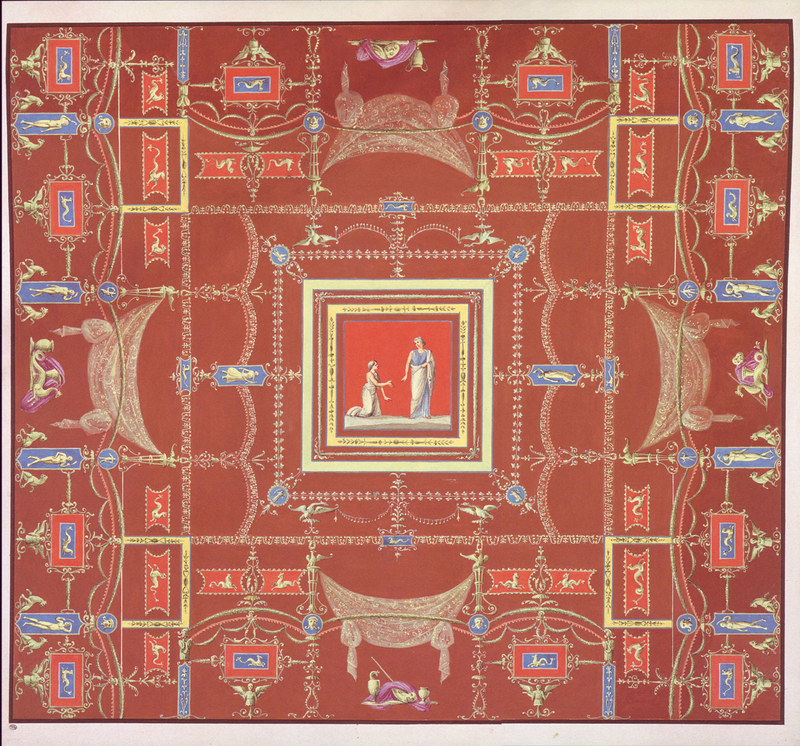 Vestigia delle terme di Tito: drawn by Francesco Smuglewicz & Vincenzo Brenna; engraved by Marco Carloni; hand-coloured and presented in an album; published by Lodovico Mirri for Pope Clement XIII. Some of the watercolour paintings for the series can be seen in the National Museum in Warsaw. See Sheryl Reiss, op. cit., pp.109-113.